Brand new 2014 GIBSON LES PAUL FUTURA - PACIFIC BLUE. PLUM INSANE, GOLD BULLION. 100% mint, unplayed, not been a demo in a retail store. Genuine made in USA. 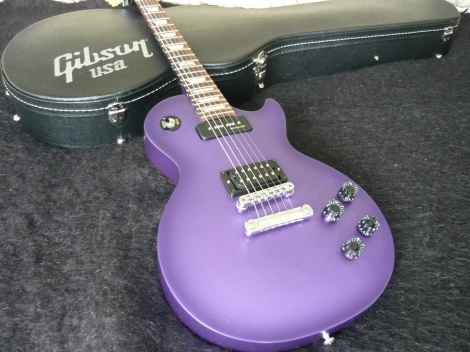 The Gibson 2014 Les Paul Futura Plain Top Electric Guitar celebrates Gibson's 120th Anniversary in style. It has a mahogany body with modern weight relief and a plain maple top. The maple neck has a '60s slim taper. The rosewood fingerboard has trapezoid inlays and sports a 120th Anniversary banner at the 12th fret. Other key features include a P-90H Sidewinder Humbucker and BurstBucker 3 pickups with Push/Push coil tap and 15dB boost. Also comes with max grip speed knobs, the Min-ETune system, Graph Tech nut and chrome locking tune-o-matic bridge. Min-ETune is a small compact battery powered tuning unit that sits on the back of the guitar. The system is hardly visible from the front of the guitar. You can still adjust the tuning pegs manually or turn on the Min-ETune to choose from 12 popular tunings or program six of your own. Banner inlay at the 12th fret. New extra large strap button.